Objective of the Study: To determine if eye tracking technology can be used to accurately assess laparoscopic skill. There remains a continued lack of objectively determining the skill level of a laparoscopic surgeon. 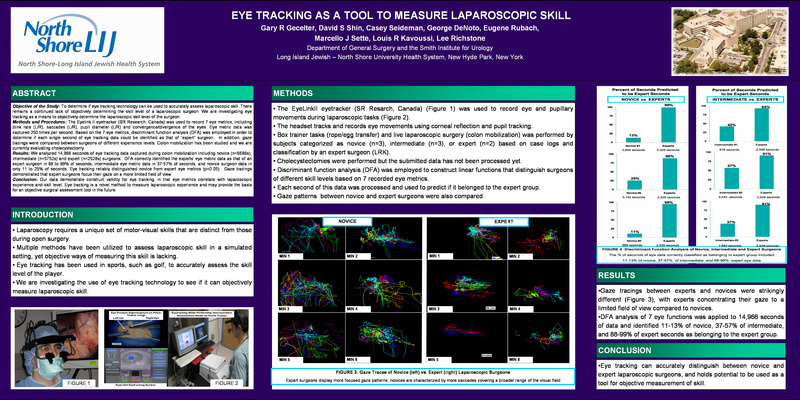 We are investigating eye tracking as a means to objectively determine the laparoscopic skill level of the surgeon. Methods and Procedures: The Eyelink II eyetracker (SR Research, Canada) was used to record 7 eye metrics, including blink rate (L/R), saccades (L/R), pupil diameter (L/R) and convergence/divergence of the eyes. Eye metric data was captured 250 times per second. Based on the 7 eye metrics, discriminant function analysis (DFA) was employed in order to determine if each single second of eye tracking data could be identified as that of “expert” surgeon. In addition, gaze tracings were compared between surgeons of different experience levels. Colon mobilization has been studied and we are currently evaluating cholecystectomy.